As Australia continues to emphasise card over cash, give your customers the freedom of accepting EFTPOS payments with the latest technology. 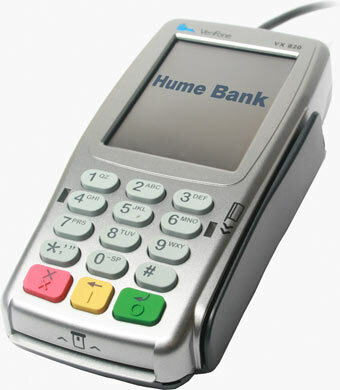 Hume is able to provide your business with the latest EFTPOS facilities, giving you the ability to combine merchant services with your Hume Business Banking services. Includes support for contactless 'tap-and-go' payments. Including Visa, MasterCard, American Express, JCB, Diners Club, and UnionPay International. Reduce exposure to theft or misappropriation of cash on hand. 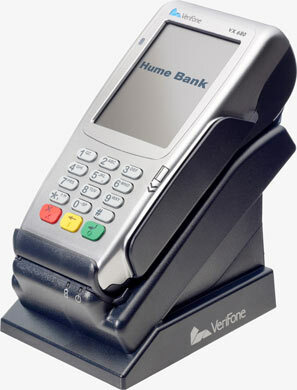 A detachable terminal that allows you to accept payment wherever your customers are. The information is of a general nature only and does not purport to be a complete description of the product. You should consider the product terms and conditions before making any decisions regarding this product. The product is only available to approved business customers. EFTPOS Mobile is a portable full-featured terminal that enables you to accept payment wherever your customers are. contactless wpayment acceptance, it could not be easier to complete transactions on the go. EFTPOS Countertop is compact and easy to use with a large vivid colour touchscreen and contactless payment acceptance incorporated into a single device. 1) Includes Visa, MasterCard, UnionPay International and eftpos Debit transactions. Unused Included Turnover expires at the end of the month and does not carry forward to subsequent months. American Express and Diners Club International transactions are not included in the plan and are charged as per merchant agreement with American Express or Diners Club International. Alternatively, call us on 1300 004 863, 9am-5pm Monday to Friday to book in an appointment.